Tryfonia is L-5-hydroxytryptophan (5-HTP) derived from Griffonia simplicifolia seed extract. 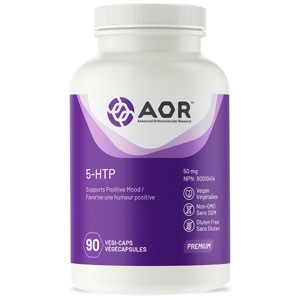 5-HTP is a metabolite of the amino acid tryptophan, and an essential precursor of the neurotransmitter serotonin and the neurohormone melatonin. 5-HTP is primarily used to support mood through its ability to boost serotonin levels. 5-HTP has been compared to various tricyclic antidepressants and has been found to be as effective with fewer side effects and quicker effectiveness. Since serotonin and melatonin are involved in regulating the sleep/wake cycle, 5-HTP also enhances sleep quality. Additionally, research supports a role for 5-HTP in reducing migraines and the symptoms of fibromyalgia. Studies in Spain and Italy found that 5-HTP was comparable to the drug methysergide in alleviating the symptoms of migraines (over 70% in both groups) while eliciting considerably fewer side effects. Fibromyalgia patients have been found to have low serotonin levels and have shown symptomatic improvement with the use of tricyclic and SSRI antidepressants. Several clinical trials have confirmed significant improvements in symptoms, including pain, morning stiffness, nervousness, and fatigue. Ultimately, those who suffer with mood imbalances such as low mood and anxiety, or from migraines, fibromyalgia or sleep disorders may benefit from taking AOR Tryfonia. AOR also offers Tryfonia Max, which is twice the strength of regular Tryfonia. ADULT DOSAGE: For healthy mood balance, take 1-2 capsules three times daily with food; for relief of symptoms of fibromyalgia, take 2 capsules three to four times daily with food. To minimize gastrointestinal side effect risk, start at 50-100 mg two to three times daily and slowly increase to an effective dose over 2 weeks. Use for a minimum of 1 week to see beneficial effects for mood balance and 2 weeks for the alleviation of fibromyalgia symptoms. Consult a health care practitioner if symptoms persist or worsen or for use beyond one year. CAUTION: Consult a health care practitioner prior to use if taking carbidopa or drugs/supplements with serotonergic activity, including, but not limited to, L-tryptophan, SAMe, St. John's Wort, antidepressants, pain killers, cough/cold medication containing dextromethorphan, anti-nausea medication or anti-migraine medication. Some people may experience gastrointestinal disturbances such as diarrhea, nausea, vomiting and abdominal pain. May cause drowsiness; exercise caution if driving or operating heavy machinery or engaging in activities requiring mental alertness. Discontinue use and consult a health care practitioner if you experience skin changes, weakness, oral ulcers, or abdominal pain accompanied by severe muscle pain. Do not use if you have scleroderma, if you are pregnant, breastfeeding, or trying to conceive. Not to be used by individuals under the age of 18 or those with a medical condition.